If they can survive the harsh world of freight. If a company isn't talking about the transformation of transportation there's a good chance it might get caught flat-footed when cars start driving themselves loaded with battery packs. Mostly these conversations center around passenger vehicles, but trucks could do with some cleaning up, too, and one of the companies on the forefront of that is Daimler. The parent company of Mercedes-Benz, Fuso, Freightliner, bus-maker Thomas and a whole host of other companies is investing heavily in electrified trucks. It's easy to imagine that most semis we see on the highway are enduring multistate treks. In reality, most of those big trucks -- especially in areas near ports and railroad hubs -- are transferring freight from those locations to warehouses, where they'll reach their final destination via smaller trucks. 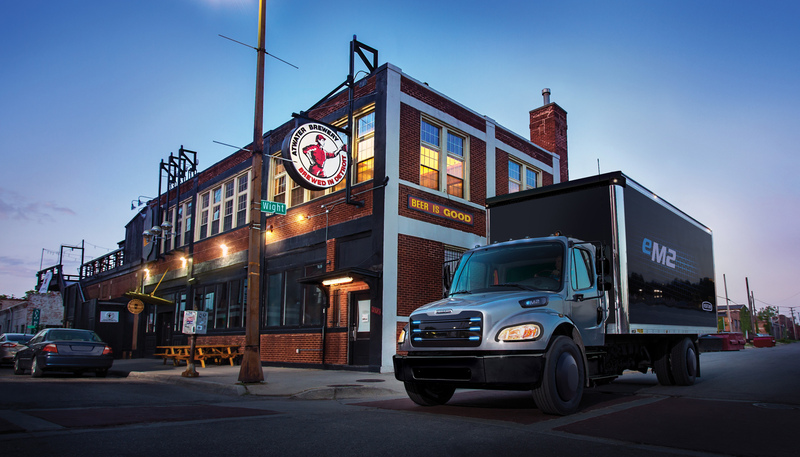 It's those local trucks Daimler is electrifying and at an event in Portland, Oregon, yesterday it unveiled two electric freight-hauling machines. The larger of the two -- and what you imagine when you think big rig -- is the heavy duty class 8 eCascadia (based on the diesel Freightliner Casadia line). For local deliveries, the company showed off the smaller eM2 which is based on the ... you guessed it, Freightliner M2 line. Both trucks have ranges over 200 miles (eCascadia will go up to 250 miles while eM2 tops out at 230 on a full charge). For those trucks that travel about 150 miles per day, electrification makes a lot of sense. Daimler isn't putting these trucks into production just yet though, first it's handing out 30 to select customers this fall. "They'll be tested with real customers, with real freight on real American highways. That'll give us the learning we need to understand the durability of the batteries," Roger Nielsen, CEO of Daimler Trucks North America told Engadget. No one knows how well battery packs will fare on a big truck after 500,000 miles, not to mention 1 million miles of heavy-duty use, according to Nielsen. Can they survive that type of nonstop punishment? That's what Daimler hopes to find out during its tests with partners. 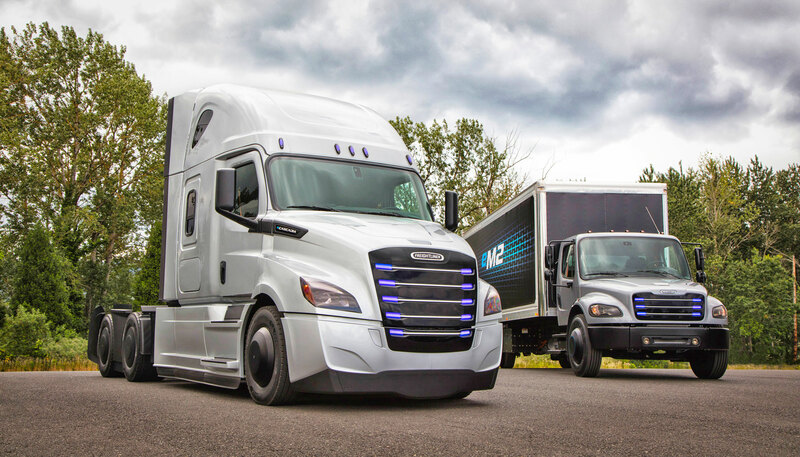 While it's working on bringing more electric trucks to the roads, Daimler also announced the opening of the Automated Truck R&D Center in Portland. But don't expect the first electrified semis to have anything other than the semi-autonomous features already found on other vehicles in the Daimler lineup. "We don't believe in level-five trucks. I don't think we're ready for that," Nielsen said. "One day you'll see a highly automated electrified vehicle." Like the rest of the evolution of transportation, none of this will happen overnight. Daimler wants to make sure it's there when it does. For now, at least, it's focusing on putting a lot of big vehicles on the road that doesn't pump out huge clouds of smog.